The best care you can give your natural stone is preventative care. Preventing stains or scratching before they happen is far easier than getting rid of them after the fact. Granite countertops are surprisingly resilient to stains, and practically impossible to scratch. But, as a preventative measure, wipe up any spills on the countertops within a reasonable amount of time. Don’t let liquid sit on countertops overnight. Granite is most prone to staining by oil and acid, so blot these spills up soon after they happen, and then clean the stone with mild soap and water. Marble countertops and tabletops are easily stained by acidic foods like fruit, tomato sauce, coffee, and wine. Blot, do not wipe, any spills up immediately, and then clean with mild soap and hot water. Do not set hot pans directly onto marble. And place a mat or pad between marble and anything which might scratch it, like a pan or utensils. Use coasters between marble and any glasses, especially ones containing acidic compounds like fruit juices, wine, or coffee. The use of sealers is also a powerful preventative measure. Granite is dense, but quite porous – you only need to leave a tablespoon of water on a counter for 30 minutes or so to find a deep stain. It is important to seal granite to keep it looking good for a long period of time.To maintain the look and slip resistance of granite, it is important to use a high quality, invisible impregnating sealer. At ROBINSON STONE we are constantly improving and updating our products as new advances in technology are made. 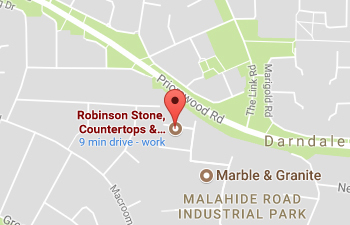 We’ve now introduced a LIFETIME warranty on our work surfaces.You can now buy in confidence a Robinson Stone work top knowing that it will be ultra hygienic and free of bacteria, mould, viruses and other toxins. With our unique sealing process your granite will be permanently sealed, thus eliminating the need to reseal it on a regular basis. This revolutionary new sealing process will make your worktop smoother and shinier with the added benefit of making it look ultra bright and vibrant for life. This unique process creates a permanent molecular bond deep in the stone whilst still allowing the stone to breathe. Your worktop will be hydrophobic and stain proof. It will prevent liquids, germs, bacteria and other toxins from penetrating the surface. DON’T worry, if you get a significant stain or scratch, that your entire natural stone investment is ruined. Virtually anything can be fixed with professional help. Silestone is the world leader in quartz surfaces. Available in over 100 distinctive colours, Silestone® is ideal for use in a wide variety of applications ranging from work surfaces to tiles, vanity units, bar/reception tops, steptreads, splashbacks, wall cladding etc. Silestone® by Consentino is the first and only quartz surfacing material in the world, with patented Microban® antibacterial protection. This helps fight the growth of micro-organisms and harmful bacteria, which may be on the surface. The antibacterial protection is incorporated entirely throughout all Silestone® Quartz products during the manufacturing process, providing continuous protection, which cannot be removed or eliminated during the lifetime of the product. Functional, beautiful and hygienic with scratch and stain resistance, Silestone® Quartz worktops are simply unique. Silestone is an engineered stone product composed of quartz and resins combining the natural beauty and durability of stone with the consistency of an engineered product. Silestone comes in a large variety of colours to suit every taste and endless applications; examples being; kitchen worktops, vanity tops, cladding and flooring. Silestone requires very little maintenance as its unique production process creates a high gloss, non-porous surface, which prevents fluid absorption. Whilst extremely durable Silestone will continue to maintain its colour and shine for many years if it is treated with care. On a day-to-day basis Silestone simply requires a wipe down with soap and warm water which will maintain its natural beauty and shine. As Silestone is not porous it does not require the application of any surface sealants and is naturally highly resistant to surface staining from cooking oils, wine, coffee etc. In the event of any stubborn marks, firstly wipe the Silestone surface clean with warm water and Cif Household Cream. For marks that harden when they dry (food, gum etc) remove by gently scraping the material off the Silestone surface using a blunt plastic blade then wash and remove any residual matter with Cif and warm water. Any lime scale or water stains can be removed using Viakal, which is available from all major supermarket chains. Manufacturers usage recommendations should be adhered to. Silestone is extremely resistant to heat and can withstand moderately high temperatures for brief period of time without damage. Although Silestone is more heat resistant than most other surfaces, all stone can be damaged by sudden and extreme temperature changes especially near the edges. For this reason we strongly recommend using a trivet or hot pad to protect your Silestone work surface from extreme heat. Avoid exposing your Silestone work surface to strong chemicals and solvents. Items to avoid include nail polish remover, neat bleach, caustic soda, paint strippers and cleaning solutions that contain trichlorethane or methylene or dimetil chlorine. Also avoid highly aggressive cleaning agents like oven/grill cleaners that have high alkaline/PH levels. Although your Silestone work surface is extremely scratch and heat resistant. We recommend that you protect the beauty of your tops by using a cutting board whenever using knives and a hot pad/trivet when using hot pans. are utilised worldwide successfully for cleaning, impregnation, sealing, care, crystalisation and slide protection of natural stones. Your high quality natural stone deserves the treatment with our professional products.